It is rare that architects summon up the notion of disappearing when designing their projects. The very essence of architecture is the exact opposite. It is there to be seen, displayed, to make an impression. Sometimes, a site dictates the need to adopt a strategy where things are buried or hidden. 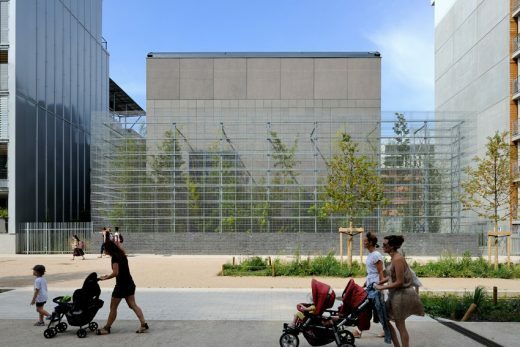 This programme, at the heart of the Confluence district in Lyon, was intended to renovate and extend an electrical substation, which led the architects to imagine ways of making the object disappear. The project took up the challenge of producing something that would actually fade from memory and vanish over time. Built in 1991 on wasteland outside of the city, the original building was an enormous industrial vessel, washed up in no man’s land. Twenty years later, it is at the heart of a revitalised neighbourhood that has been developed with a solid commitment to contemporary architecture, mixed use, and high environmental standards. With this in mind, the designers decided to integrate and expand the original building without absorbing it, in order to detract from its purely technical role. To this end they have created a poetic oasis, dominated by nature. 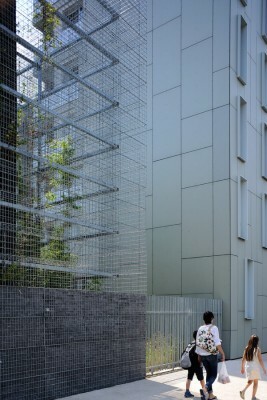 A vertical bamboo garden surrounded by walls of gabions gave this object, that is unresponsive in nature, a new status as a mineral and vegetal urban space. – The renovation and extension of the substation in a spirit of continuity. The transformer now occupies the centre of block E where it is surrounded by social housing, housing for general purchase and office space. 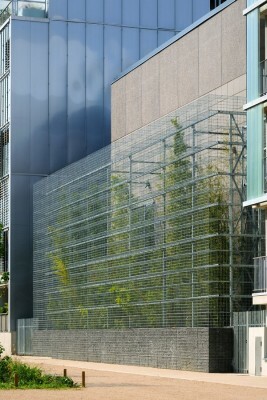 The four programmes occupy the perimeter of the block and the inner-gardens run alongside the facility. The programme includes the renovation of the existing building, a 1,300 m2 extension to double the initial surface area, and the architectural development and landscaping of the whole structure. The original building is composed of two enclosures which house the transformers. It is composed of simple volumes, covered with alternating bands of brown tiling and sandy beige concrete panels, mounted with three cylindrical vaults which give it a very distinctive silhouette. Although at a height of 9 metres it is much lower than the neighbouring buildings, it is still a very solid structure. The extension includes a new substation at the same height, and a distribution substation, known as a gas-insulation substation or GIS at a lower height. In order to unify this disparate set of units, the architects opted for a very simple approach that ensured coherence between the old and new parts, without overwhelming the original building. The colour black is used to harmonise the whole structure using a surface coating over the old part and steel cladding on the new part, forming an overall backdrop. From an urban perspective, the building stretches between Cours Bayard and rue Casimir Perrier, naturally fitting into the existing orthogonal layout. A second skin, made up of a metallic mesh, fleshes out the building giving it unity, coherence and increased visibility within the neighbourhood. 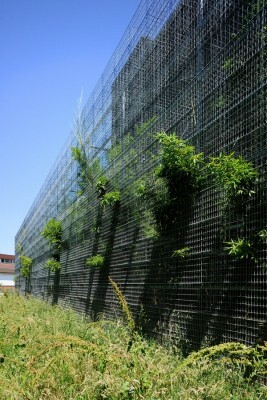 Gabion cages made of galvanised steel are either left empty or filled with Hainaut® blue limestone or plants. Reaching up to 9 metres in height, these are either fixed to the concrete walls or an independent structure when located at a distance from the facades. 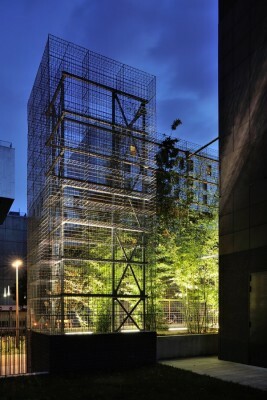 The extensive planting, made up of a forest of bamboo, enhances this very mineral building. It brings a spark of life to the enclosed space. The choice of rustic plants limits the need for maintenance, watering etc. 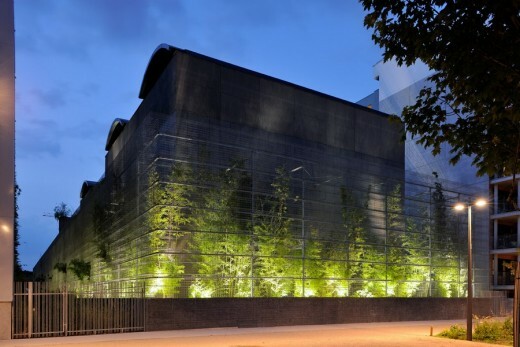 The green roof, planted with sedum, completes this vegetal envelope and created a block of greenery visible from the neighbouring buildings that dominate the surrounding area. The substation is a closed space which cannot be entered and which has very few visitors. It pervades a certain sense of mystery, but also raises a number of concerns. In order to overcome the austerity of this exclusively technical building, the architects have created a key feature for enhancing the magic of the space. Appearing through the metal grids, the bamboo forest, with all its exotic evocations, diffuses a powerful poetic force. The drystone laying of fine stone provides a solid foundation and gives a sense of strength to the whole structure. The balance and complementarity between the stone, metal, and plants plays on the contrasts between heavy and light, empty and full, hard and soft. At night the lighting changes our perception of the building whilst the register remains poetic. This programme had to cope with a number of technical constraints, comply with standards, and manage a complex worksite located between four buildings under construction. At the same time, the project also had to meet with the ambitious environmental objectives set by SPL Confluence. The buildings are mostly used to store extraordinary pieces of equipment that pose constraints in terms of dimensions, technical accessibility, safety access corridors and walkways. The ERDF transformer enclosure is positioned in line with the existing building, whilst the RTE GIS is located on the southern boundary of the plot, on Cours Bayard. The architects have used simple principles to manage these constraints, drawing their inspiration from the existing sections of the building. From a technical point of view, the two key issues were the acoustic treatment to limit noise and vibrations, using the latest techniques decoupling the foundations of the new transformer and no sliding bearings. The systems used to limit energy consumption were selected on the basis of the total cost. The solutions used include external wall insulation, a facade composed of materials requiring limited maintenance, aluminium frames with triple glazing, green roofs, rainwater collection, energy recovery ventilation etc. 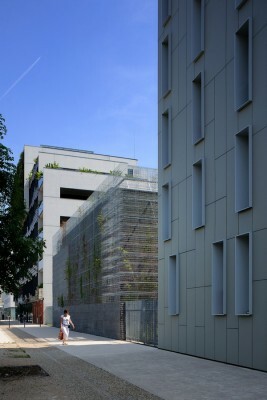 The double casing created by the gabions and the bamboo forest, the project’s signature, also plays an environmental role (sun protection and cooling).